Rescue, Adopt, Repeat...that is our story. We are a Foster-Based Rescue that focuses on finding forever homes for dogs. We care for dogs who are abandoned or surrendered at shelters, sick, young and old, and simply left behind. We make sure they are treated with loving care, treat their medical issues, spay/neuter, and foster them until we find an adoptive family who will care and love them for the rest of their lives. Our rescue is all volunteer based and committed to our rescue dogs. 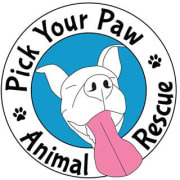 Pick Your Paw is SUPER excited for the opening of our Pick Your Paw Adoption Center at the Freehold Mall on Dec 2nd!!!!!!! We would love to have your help to pet the dogs, love on the cats, clean cages, and more! COALITION FOR ANIMALS INC accepts donations. Donate Now. Would you recommend COALITION FOR ANIMALS INC?